This Eero WiFi Review will clearly state that those times are over. I have always experienced Wi-Fi connectivity issues. My house isn’t huge, and yet there are still dead spots in all corners and the Wi-Fi suffered from unexplained, constant dropouts. At times, it's ok for some months, after which it’d again require frequent restarting. After switching up routers a few times, the problem resolved, but through all of the equipment changes, I found a Wi-Fi system that has revolutionized routers for users. It is the Eero Home Wi-Fi System. Time to present it's features and specs in our Eero wifi review. It is extremely frustrating when a video you’re watching doesn’t buffer smoothly, or when your work is interrupted due to Wi-Fi glitches or its speed. Probably the worst is when you are playing an online game and you lose your progress due to a weak connection. This occurs due to spaces where the Wi-Fi is unable to provide full signals and for this purpose, a home Wi-Fi system fixes and smoothens connectivity issues that you may experience at your home, workplace or any other environment. If you find that any of the above-stated issues continue, then maybe it is time to look into getting a Home Wi-Fi System like Eero. Of course, make sure that there aren’t any other problems first. Maybe the issue isn’t weak routers at all. As its name suggests, Eero comprises of small, white connected routers that are installed wherever you like around the house. The white boxes secure a reliable mesh that is able to adjust itself when needed as well as monitor performance. This means that you will have a hassle-free Wi-Fi system which will require little to no maintenance. If you have a small area to cover, then you can probably get by using only one of the router units. 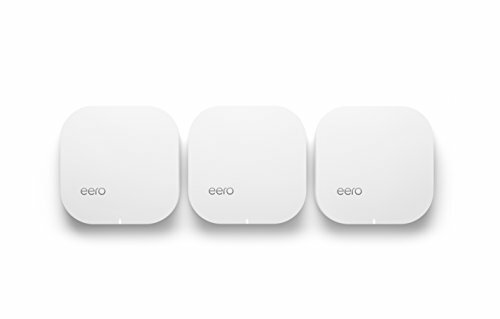 For any large spaces or if you want to install extra routers in order to connect them to devices in other rooms, then you can add the other Eero boxes. Conveniently, the routers are sold as singles, packs of 2 and packs of 3. This is great because you won’t have to splurge on the complete set if you just want one. The back of the devices features a power button, 2 GB Ethernet ports, and a USB port. According to Eero, standard Wi-Fi boosters divide the bandwidth in half because there is only one radio for both sending and receiving signals. Eero is equipped with two radios, which I guess is the reason why it works flawlessly. Firmware updates are downloaded and installed automatically, and any minor glitches are self-diagnosed and fixed. In case of any major problem, you will be able to see on your Eero app exactly which unit is experiencing the issue and a recommended solution for it. Some advanced features are also available for technology buffs, such as IP settings, DHCP, DNS, NAT and controls for port forwarding. Google Wi-Fi: The Eero is great, but its price is not so great. Alternatively, Google Wi-Fi seems to offer more or less exactly the same thing at an affordable price. There is an app, updates, and it is more than likely that updates in the near future will have better tools for home automation using the Android platform or in combination with Google Assistant. Plus, it is Google, so the brand is obviously reliable. Luma is another competitor product that looks the same, costs almost the same, and adopts a similar approach to fixing problems as Eero. The only main differences between the two are that the Luma comes in three different colors and has more in-depth functions for privacy. So if you are a concerned parent, for example, the Luma is going to give better parental guidance options. Eero creates a network that seamlessly covers large spaces with fast internet access. Additional units can be added easily to your home network. Still not the fastest for tasks that are bandwidth-heavy. Cannot be managed without connecting to Eero’s servers. The setup is ridiculously simple, which is great because who wants to go through manuals with technical jargon written in them and figure out how to get the product running right? All you have to do is download the Eero app, connect the primary router to your modem and simply input your basic settings and preferences. The hardware doesn’t offer much because the network settings are monitored and controlled via the dedicated Eero app. You will be able to view a ton of information about your Wi-Fi speed, have the ability to create profiles, test your internet speed, see which devices are currently connected to your Wi-Fi network as well as when was the last time they were connected. Additionally, you can view how strong your connection is, its type and the MAC and IP addresses. These are really nifty features, giving you complete control over your Wi-Fi straight from your smartphone. The two Ethernet ports present on the Eero routers are commendable. A lot of us use the internet for pretty much everything, be it gaming, be it streaming Netflix, HBO NOW or watch sports. So instead of connecting all devices straight to the main Wi-Fi router, the Ethernet ports allow devices to be hardwired to the system using the secondary routers. This will ensure a much more stable connection and in theory, it seems like a well-thought-out solution. The Eero Home Wi-Fi System doesn't have many accessories but that's not an issue because it haves everything you need. As you open the box you will find the two routers after you take those out you will see the Quick Start Guide that recommends installing the app before you go any further and underneath you'll find two power adapters and an Ethernet cable. The Eero Home Wi-Fi System is packed with quite the hardware power for a device of its kind, 1.0GHz dual-core processor, 512MB of RAM and 4GB flash storage used for updates and new features that will be available frequently. Has the following power requirements 100-240V AC, and a 50-60Hz frequency, the app can run on iOS as well as on Android. Security is strong, it uses WPA2 encryption it's Bluetooth smart ready and has Dual-Band support, 2.4GHz, and 5GHz. The device itself has two Ethernet ports, 1x USB 2.0 slot, and the female power jack. The Eero Home Wi-Fi is definitely going to make your house more internet efficient and smart. All of the tools and information will be available at your fingertips and you are most likely going to forget ever experiencing any internet connectivity issues. If the Eero interests you then you can purchase it from Amazon and Best Buy. We hope you liked our Eero WiFi Review and if you have suggestions feel free to send us a message, we are always looking for new ideas.